The top quark, the heaviest known elementary particle, has a unique place in the Standard Model. By precisely measuring its properties, ATLAS physicists can probe physics beyond our current understanding. A new ATLAS result examines one of the top quark’s more subtle properties seen in top-antitop pair production. The strong interaction predicts that the top quark is preferentially produced in the forward (or backward) region of the ATLAS detector, while the top antiquark is produced more centrally. This subtle “charge asymmetry” is expected to be small in the Standard Model (around 1%), but it could be enhanced by new physics, especially when the top-antitop pair has a large invariant mass. ATLAS first performed this difficult measurement using its 8 TeV dataset, leading to an overall relative uncertainty on the charge asymmetry of 56%. To improve on this, ATLAS joined forces with the CMS collaboration. 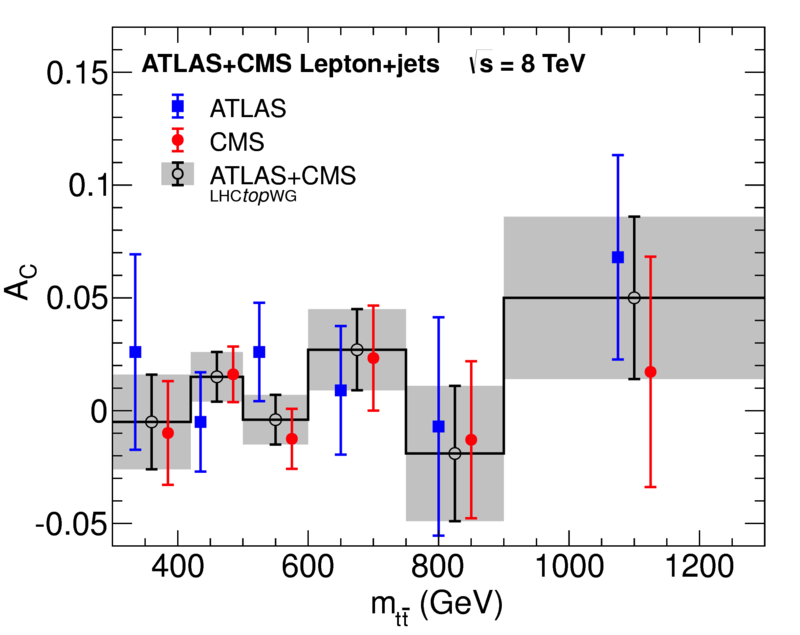 The resulting combined measurement is the first common ATLAS-CMS publication on top quark physics and is emblematic of the cooperative nature of high-energy physics. Performing such a combination requires a detailed understanding of correlations between the measurements, introduced by signal modelling and other uncertainties common to both experiments. These correlations can be estimated by studying how the individual measurements depend on systematic uncertainties. The analysis uses the 7 TeV and 8 TeV datasets from ATLAS and CMS for the inclusive combined asymmetry measurement. The combined differential charge asymmetry versus the invariant mass of the top-antitop pair is measured using only the 8 TeV datasets. The precision of the combined results is significantly improved with respect to the individual ATLAS and CMS measurements. The resulting inclusive and differential charge asymmetries are in agreement with the latest Standard Model predictions and thus limit contributions from possible new physics phenomena. Combination of inclusive and differential tt̄ charge asymmetry measurements using ATLAS and CMS data at 7 and 8 TeV (arXiv: 1709.05327, Figures).